In 2007, Historic Charleston Foundation received a grant from the Gaylord & Dorothy Donnelley Foundation to expand the Ashley River Historic District, which was originally listed on the National Register of Historic Places in 1994. The expanded district was designated in 2010 and now encompasses more than 23,000 acres. Expanding the Ashley River Historic District was just one part of a decades-long, collaborative effort to preserve the area's significant natural, historical and cultural qualities. This effort is ON-GOING as there remain serious threats to this area, but substantial progress has been made. We believe that preservationists, conservationists, community leaders, and property owners from around the country can learn about implementing “whole place preservation” by using the historic Ashley River Corridor as a case study. Whole place preservation is built upon the principle that land conservationists, historic preservationists, and other activists are more effective when they work together to save and protect our special places. For over forty years, land owners, preservationists, conservationists, politicians and the larger community have used every tool and approach at their disposal to protect the Ashley River Corridor. We have learned that whole place preservation requires constant vigilance and never-ending advocacy. It takes an enormous investment of time and effort but the result—a protected area that is recognized as significant by a broad swath of the community—is worth it. Planning for "Whole Place Preservation"
Understand the area's history and educate the public about its significance. Collaborate with conservation community and property owners, and support grassroots campaigns. Realize the importance of politcal support. Be proactive and flexible in ongoing preservation and conservation efforts. Utilize current technology to inventory resources. Acknowledge land use patterns and infrastructure investment as critical elements. The existing Ashley River National Register District is expanded in size from roughly 7,000 acres to nearly 24,000 acres. Mead Westvaco re-purchases the Watson Hill Tract with the intent of pursuing a more conservation-friendly development concept. 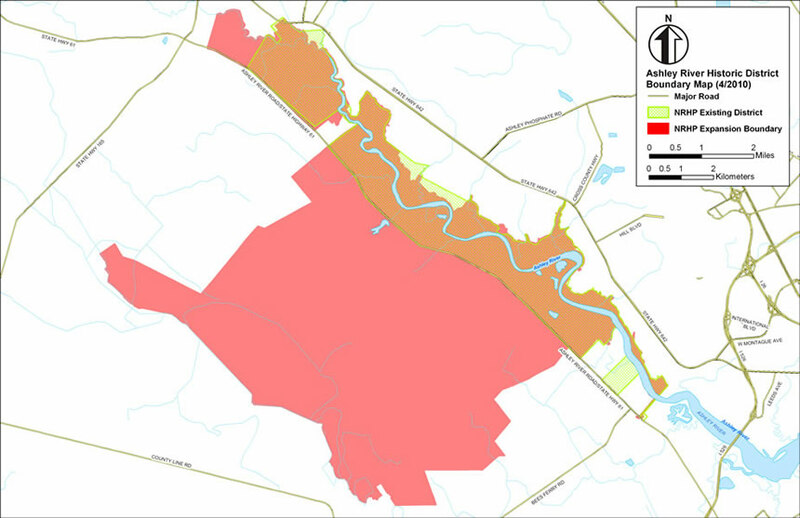 The Dorchester County Ashley River Historic District Overlay ordinance is passed, limiting density and providing for buffers in the three districts of the overlay. The Watson Hill development is held up by a series of annexation fights and subsequent lawsuits. The 6,600-acre tract known as Watson Hill is sold by Mead Westvaco for residential development. Mead Westvaco sells 4,500 acres known as Poplar Grove for residential development. The Ashley Scenic River Advisory Council (ASRAC) produces the Ashley Scenic River Management Plan to protect and guide the future conservation of the river. A comprehensive management plan, The Ashley River Road Scenic Byway Management Plan, is authored by Ashley River Regional Coordinator Allison Bello. The Ashley River Road is designated a National Scenic Byway. The Ashley River Road is designated a State Scenic Byway by SC DOT. The Ashley Scenic River Advisory Council (ASRAC) is founded and includes stakeholders, including riparian landowners, conservation organizations, and concerned citizens. The Ashley River is designated a State Scenic River by SC DNR. Berkeley Charleston Dorchester Council of Governments (BCD COG) and Clemson’s Strom Thurmond Institute track the rate of growth within the tri-county area. The Institute’s study predicts that the region’s urban footprint will likely expand to more than 800 square miles by the year 2030. Drayton Hall acquires three parcels of land totaling 105 acres across the river from the plantation and house, successfully preventing the development of condos and ensuring that the Drayton Hall view shed remains unobstructed in perpetuity. The Ashley River Conservation Coalition is established. Ashley River Road is listed by the National Trust for Historic Preservation as one of the 11 Most Endangered Historic Places in America. The first Ashley River Historic District is listed on the National Register of Historic Places. Drayton Hall helps to produce and pass an ordinance for the City of Charleston mandating vegetative buffers of increasing depths proceeding north along Ashley River Road from Village Green subdivision. The Special Area Management Plan (SAMP) for the upper Ashley River is approved by the SC Coastal Council. The SAMP sets the foundation for subsequent conservation actions taken along the Ashley River. The SC State Historic Preservation Office makes a formal request to the South Carolina Coastal Council (now the Office of Coastal Resource Management, OCRM) asking it to undertake the development of a special area management plan for the historic Ashley River Corridor. The 61 Corridor Growth Management Plan, authored by the BCD COG, is adopted by Charleston City, Charleston County and Dorchester County as a ten year planning document. Charleston County adopts a moratorium on all re-zonings in the Ashley River Corridor until a growth management plan is adopted. Ashley River Road is listed individually on the National Register of Historic Places. Berkeley Charleston Dorchester Council of Governments (BCD COG) generates the Ashley River Study. Oak trees lining Ashley River Road are threatened by road widening. Significant growth of residential development begins along Ashley River Road.